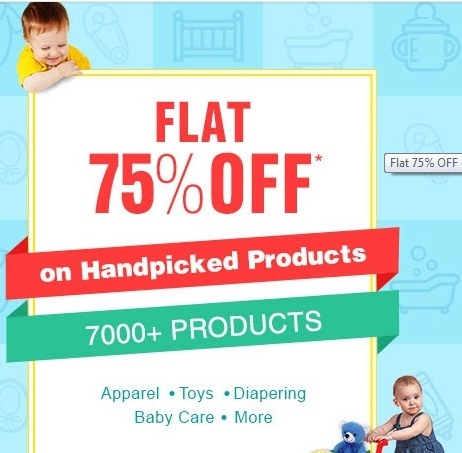 FirstCry has come up with a loot deal of flat 75% discount on selected products. One user can use the offer code only for one product. The offer is valid only till 16 October 2015. Hurry up!! How to avail this offer - FirstCry Flat 75% Offer,Coupon code, Promo Code,Discount - Loot Deal? 1. Visit Firstcry offer page here. 2. Add products listed in the offer page. 3. Use Firstcry Flat 75% off coupon code 'OCT75FLAT' before making the payment to get flat 75% discount. 1. Offer is valid only till 16 October 2015. 2. Only 1 product can be bought in this offer per user. 3. Coupon code is applicable on MRP of the product.